The billionaire founder of Taiwan's electronics giant Foxconn has announced he will run for the country's presidency, citing divine endorsement. Terry Gou will stand in the primaries of the Kuomintang opposition party, promoting a more China-friendly policy. He said sea goddess Mazu encouraged him to promote peace across the Taiwan Strait. Taiwan's presidential election is scheduled for January 2020 at a time of heightened tensions with Beijing. Should the tech-billionaire be selected as Kuomintang candidate, he would pose a significant challenge for Taiwan's first female President Tsai Ing-wen, who is fighting low approval ratings. Mr Gou is one of Taiwan's richest people and announced his bid on Wednesday at the Kuomintang headquarters. "If I'm elected, I will represent Kuomintang in the 2020 presidential election to compete," he said. "If I'm not elected, it means I haven't worked hard enough. "I will then fully support the candidate selected from the party's primary system." 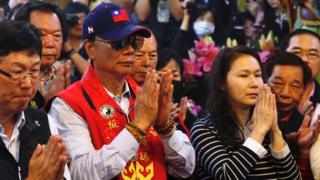 Earlier in the day he told a crowd at a popular temple in Taipei that he'd received divine inspiration for his political bid. "Three days ago, Mazu came to me in a dream," he said, speaking in a local dialect. "Mazu doesn't want Taiwanese society to be so difficult. Mazu told me to come out and do something." He said the goddess had nurtured him from a child to a grown man. "I am Mazu's godson. I want to do more for Taiwan's people. I will definitely follow Mazu's instructions." Foxconn founder Gou has made a fortune with his company manufacturing electronic devices for other companies. The firm is widely known for producing many of Apple's iPhone models. Sea goddess Mazu is widely worshipped in southern China as well as countries with large Taoist and Chinese Buddhist communities such as Taiwan, Malaysia, and Vietnam. She is believed to protect fishermen and sailors. If successful in his presidential bid, Mr Gou is expected to take a more China-friendly approach than the current administration of President Tsai. Ms Tsai became Taiwan's first female president in 2016 as the head of the traditionally pro-independence Democratic Progressive Party (DPP). The Kuomintang is Taiwan's other large political force and has governed the territory for most of the years since it broke with the mainland in 1949. While the Kuomintang oversaw the separation from China after the civil war, it still seeks to have good relations with Beijing. China sees Taiwan as a breakaway province that will eventually be reunited with the rest of the country and relations between Beijing and Taipei have for decades been marked by hostility and angry rhetoric. Ties started improving in the 1980s and Taiwan relaxed rules on visits to and investment in China. Mr Gou's Foxconn was one of the first Taiwanese companies that invested in factories on the mainland, tapping into the much lower wage costs in China. Foxconn now employs more than 1 million people, mostly in factories in China. Were Mr Gou elected, there would be questions about whether he can do what's right for Taiwan, even if it hurts his company's interests, says the BBC's Cindy Sui in Taipei.